Charming. Funny. Caddish. Handsome. Robert Downey Jr. can be described as many things, but Oscar-winner? Not yet. 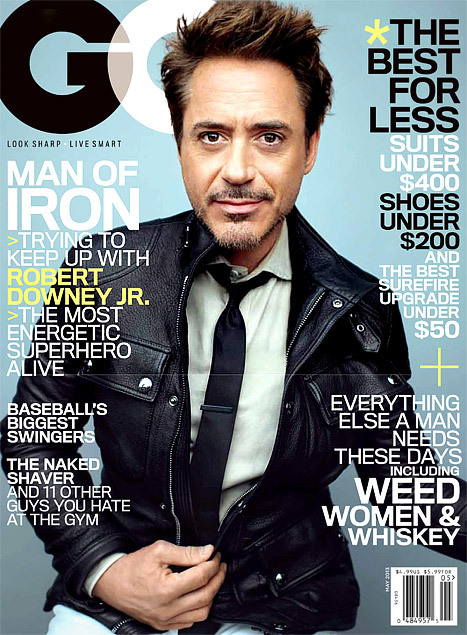 In the cover interview for GQ's April issue, Downey shrugs off his lack of naked gold statuettes. The 48-year-old actor, whose film career is nearly as old as he is, has earned two nominations for the prestigious award. And he's certain the win is coming. Is that the persona or the person speaking? Downey's two nominations came from his work in 1993 playing Charlie Chaplin in "Chaplin," when he lost to Al Pacino, and in 2009 for "Tropic Thunder," when Heath Ledger's incredible final performance as the Joker in "The Dark Knight" was a shoo-in. He told GQ he was certain then -- in 1993 -- he would take home the win. And that certainty was still there, but perhaps a little tempered. "Look, even if I don't get one directly, eventually they're just going to have to give me one when I get old," So no matter who you slice it, I'm getting one." Well maybe not just one. "I should probably have more. But zero's fine," he said "Zero, or two."